This issue of Clinics in Geriatric Medicine, guest edited by Drs. 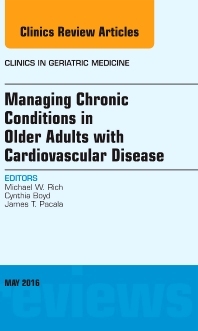 Cynthia Boyd, James T. Pacala, and Michael W. Rich, is devoted to Chronic Conditions in Older Adults with Cardiovascular Disease. Articles in this issue include: Epidemiology of multimorbidity in older adults with cardiovascular disease; Impact of multimorbidity on clinical outcomes in older adults with cardiovascular disease; Assessment of goals of care in patients with multiple chronic conditions; Challenges in decision-making: balancing trade-offs; Multimorbidity in older adults with heart failure; Multimorbidity in older adults with acute coronary syndromes; Multimorbidity in older adults with aortic stenosis; Multimorbidity in older adults with atrial fibrillation;Anticoagulation in older adults with multimorbidity; Approach to evaluating the multimorbid patient with cardiovascular disease undergoing non-cardiac surgery; Integrating care across disciplines; Assessing risks and benefits of invasive cardiac procedures in patients with advanced multimorbidity; Multimorbidity and end of life care in patients with cardiovascular disease; and Future research directions for cardiovascular disease.